For nearly a decade, veteran Democratic Rep. Peter Welch of Vermont has been waging a lonely battle to empower Medicare officials to negotiate the price of prescription drugs, just as Medicaid, the Veterans’ Administration and other government health care providers are entitled to do. When Congress enacted the Medicare Part D subsidized prescription drug program for seniors in 2003, the drug industry secured an amendment that barred the federal government from negotiating rebates or lower drug prices for Medicare beneficiaries – a sweetheart deal that subsequently provided drug manufacturers with many billions of dollars in extra profits. Welch, a liberal Democrat, condemned the restrictive policy as the ultimate in “crony capitalism” and sponsored or co-sponsored at least six bills to allow drug price negotiations. But a well-financed drug industry thwarted Welch and his allies at every turn, and the proposed legislation repeatedly was bottled up in the House Energy and Commerce Committee, or simply ignored. He concluded that big-money lobbying efforts and generous campaign contributions to key Republican and Democratic lawmakers effectively blocked his legislation, even as many consumers and policy advocacy groups clamored for ways to control soaring prescription drug prices. According to Welch and political watchdog groups, the answer is fairly simple. The pharmaceutical industry spent unprecedented sums on lobbying and campaign contributions to get the prohibition on price negotiations into the original legislation and to keep it there, despite the best efforts of Welch and others to eliminate the provision. An analysis jointly published this week by the Center for Responsive Politics and FairWarning, a non-profit news organization, highlights the political clout exerted by the Pharmaceutical Research and Manufacturers of America (PhRMA), a major industry group, and some of the largest U.S. drug companies. 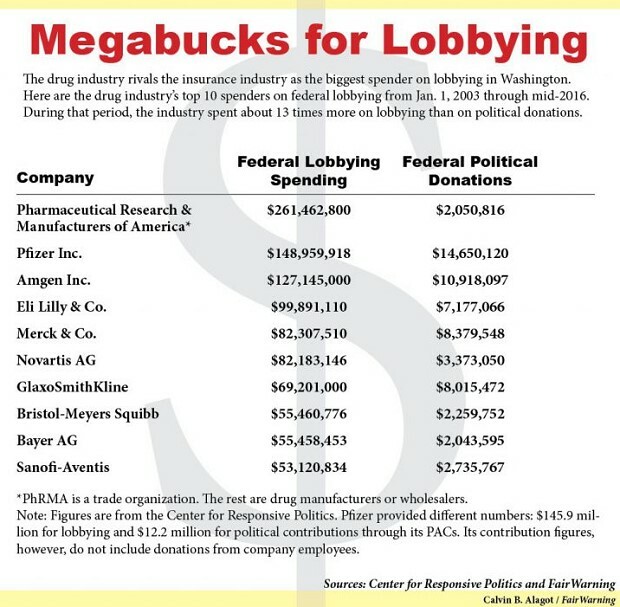 Since early 2003, the drug manufacturing industry spent more than $1.9 billion on lobbying members of Congress on Medicare Part D and other issues important to the industry. In just 2015 and the first half of this year, the industry’s lobbying bill was equivalent to spending $468,108 on every member of Congress, according to the Center for Responsive Politics. 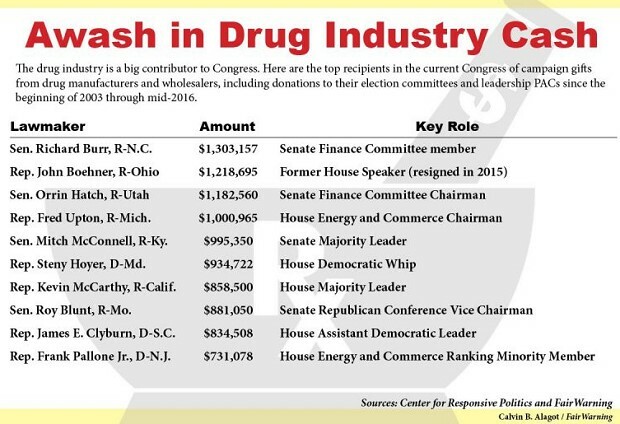 Since January 2003, drug manufacturers and wholesalers have given $147.5 million in federal contributions to congressional and presidential candidates and super PACs, according to the analysis. Of that total, 62 percent was earmarked for Republican or conservative causes and the rest went to Democrats. Four current or former members of Congress received totals in excess of $1 million – including Sen. Richard Burr (R-NC) who picked up $1.3 million, former House Speaker John Boehner (R-OH), with $1.2 million, Sen. Orrin Hatch (R-UT), chair of the Senate Finance Committee, with $1.1 million, and Rep. Fred Upton (R-MI)., the chair of the House Energy and Commerce Committee, with $1 million. The legislative ban on government price bargaining, even as prescription drug costs steadily climbed over the years, was justified by the industry and other supporters on free market grounds. They also insisted that the billions of dollars in windfall profits were needed for research and innovation in bringing out new and more effective drugs. Medicare dwarfs all other government agencies and programs in its purchase of prescription drugs. A House Oversight and Government Reform study previously estimated that Medicare officials could have saved taxpayers as much as $156 billion over the past decade had they been able to negotiate the price of drugs they purchased lower, according to Welch. And because of its negotiating power, the Veterans Administration on average can purchase prescription drugs for little more than half the price charged to Medicare. “Corporations are duty-bound to return profits to shareholders and, in the grand scheme of things, these huge sums are a pittance compared to the rewards they can anticipate,” Krumholz added. Officials at PhRMA declined today to discuss their lobbying or campaign funding strategy or to confirm how much the industry has poured into efforts to preserve the prohibition on Medicare drug price negotiating. However, they noted that private health insurers operating through Medicare are still free under the law to seek lower prices for beneficiaries if they choose, and have secured rebates averaging around 35 percent on brand medicines, as was indicated in an IMS Health study released last week. However, Welch questioned the industry’s arguments and has called for more transparency on the issue – including figures on how much of the drug industry’s profits resulting from the ban on government negotiating actually is plowed back into research and development. Welch, an attorney and ally of Sen. Bernie Sanders of Vermont, was first elected to Congress in 2006 and is a highly regarded House Democratic strategist on energy and health care issues.